I find that lots of people—myself included—love hearing about who someone’s first big freelance client was. For me, it was Cards Against Humanity. 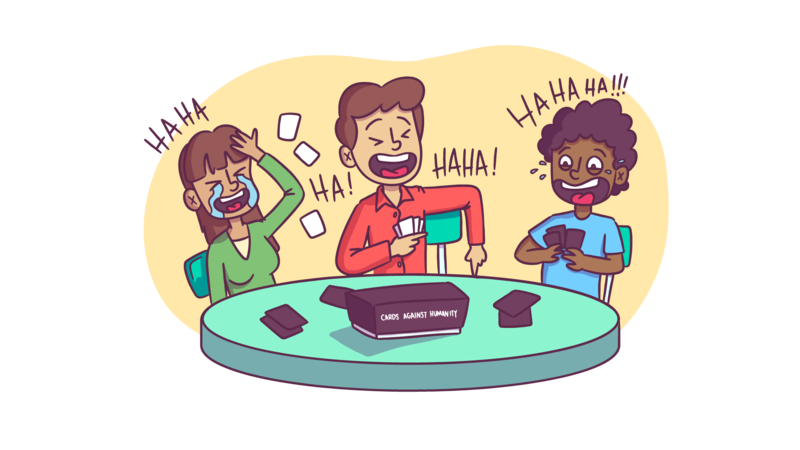 For those of you living under a rock, Cards Against Humanity is a wildly popular party game for “horrible people,” as it says on every box. It has to be one of the most fun games I’ve ever played, and maybe the least politically correct game ever created. 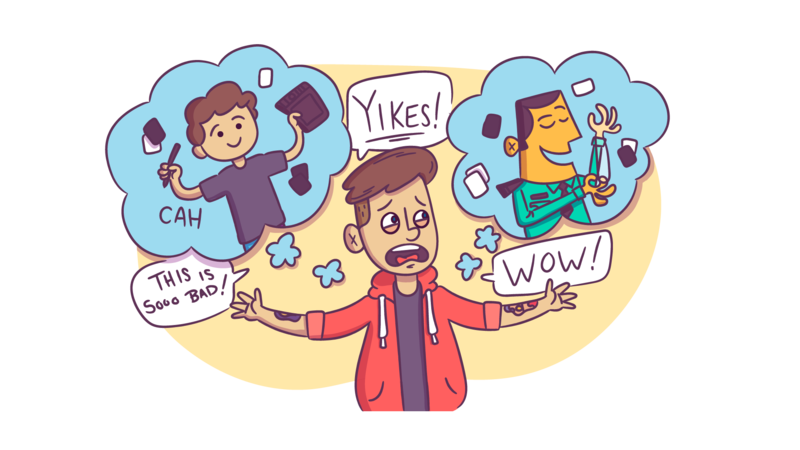 This is the story of how I landed Cards Against Humanity as my very first big freelance client. When you’re starting out as a freelancer, you never know what a contact or networking opportunity will lead to. When I was in college, Max Temkin, co-founder of Cards Against Humanity and a pretty awesome designer, contacted me after he saw some of my work. He asked me if I’d be up for working with him on some illustrations for one of his first projects, a game called Humans vs. Zombies. I wound up doing this work in exchange for him helping me create my very first portfolio site. A side note about working for free: Half of the spec projects I’ve done have led to paid work. You just have to be really, really picky when it comes to doing them. When people ask me to do free work now, I will instead propose a price. Anyway, I wound up becoming great friends with Max, so a few months after he and his team officially launched Cards Against Humanity in 2011, he came to me looking for some fun, simple illustrations for their upcoming holiday email campaign. That spec work I’d done for Humans vs. Zombies led to this paid project. I was ecstatic to be working on this—it seemed like a big deal, even with Cards still being under the radar. After I completed the project, I bugged Max every so often with emails asking “Need any help?” or “Got any new projects for me?” I was so annoying, but he really saw potential in me and continued to hire me for more projects. Sending those emails is a smart way to keep the door open with previous clients, and it takes very little time to send them. When you’re just starting out as a freelancer, nurture your relationships with people and never, ever burn bridges. I started working with Max after he saw some of my illustrations, and that led to Humans vs. Zombies, which led to Cards Against Humanity. You just never know where your next contact or client will take you. That tiny, unknown fitness app you’re working on? You don’t know where that’ll be a few years from now—it could wind up being your biggest client. I was a college kid when I created all those illustrations for Cards Against Humanity. When I look back at them, I can’t help but cringe and think, “I wish I could re-do all of that work!” It’s totally normal to feel like this. In fact, I think it’s a good thing. It means you’re getting better at what you do. You’re moving forward instead of staying the same. You’re constantly learning, enhancing your skills, and trying new techniques. As you grow your freelance career, keep this in mind. Eventually you’ll be able to look back and cringe at your old work—and you should know that’s a great sign. In our creative community, there are so many people out there willing to help you and lead you to bigger and brighter opportunities. You just have to be open to them. Work on projects you’re truly excited about. This is especially important if it’s spec work. The stuff you create is your learning experience. Each time I have a project, I get better. Sometimes I try things I’ve never done—different techniques. You may need to reach out to people and ask for help. Don’t be afraid to do that. Go to events, have a website, constantly post new work, and push the boundaries of your work to get better. Sign up for my webinar, Doodling with purpose, and learn to turn an everyday habit into a skill. It starts January 24 at 11am PT, and registration closes on January 23 at 10pm PT. 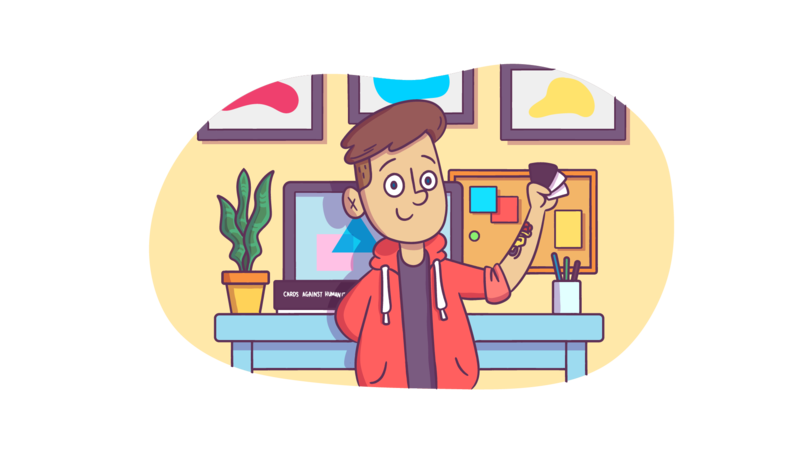 Hey there, my name is Rocky Roark, and I'm a freelance illustrator and designer based out of San Diego, CA. I have worked with a wide variety of clients including: Silicon Valley startups, political parties, gaming companies, and educational institutions.